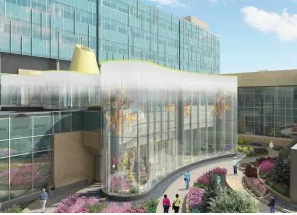 This afternoon, the Fred & Pamela Buffett Cancer Center in Omaha, Nebraska, will unveil The Chihuly Sanctuary—an extensive installation, featuring more than 200 original works by lauded glass maestro, Dale Chihuly. The sanctuary is a keystone of the Healing Arts Program at the University of Nebraska Medical Center and its clinical partner, Nebraska Medicine. and was made possible by a lead gift from Omaha philanthropists, Walter Scott and his late wife, Suzanne. The Fred & Pamela Buffett Cancer Center began construction in 2010 thanks to a major donation by Pamela Buffet and her late husband Fred, a relative of billionaire and Omaha native, Warren Buffet. Fred Buffett died of complications from kidney cancer in 1997. 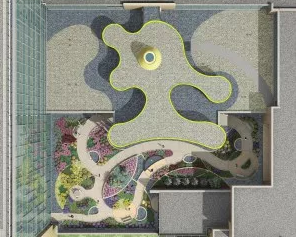 The 615,000-square-foot building cost $323 million to construct and is set to open its doors to patients in June. 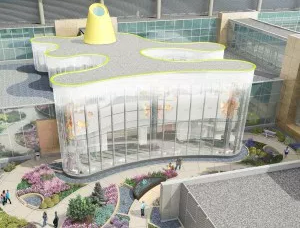 The Chihuly Sanctuary will be a place of respite and reflection for patients and their families, where they can find solace and distraction from the emotional and physical burdens of cancer. Chihuly designed ten site-specific installations for the sanctuary—an original body of work, titled Glass on Glass. To create an overlapping effect, the artist painted with vitreous-glass enamel on glass panels encased within a frame. When natural light hits the glass painted panels, the overlapping compositions work in tandem to evoke a sense of movement and multidimensionality. The organic design of the sanctuary building stands out among the surrounding architecture and was inspired by Chihuly’s iconic Macchia series, a study in color and wave-like shapes. One of the most prominent works on view at The Chihuly Sanctuary is a conical glass structure that casts a shadow when natural light passes, creating variable contrast as the sun moves throughout the day. Given the artist’s popularity, it comes as little surprise that the sanctuary is not Chihuly’s first collaboration with a hospital. Since 2010, his work has been on view at University Hospitals Ahuja Medical Center in Beachwood, Ohio.